Gregory House, M.D. is a fictional antihero and title character of the American television series House. He is played by Hugh Laurie. House is the Chief of Diagnostic Medicine at the fictional Princeton-Plainsboro Teaching Hospital, where he leads a team of diagnosticians. 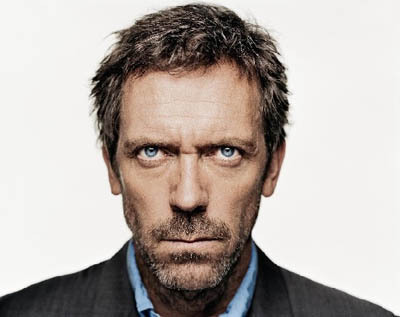 House's character has been described as a "misanthrope," a "cynic", a "narcissist" and a "curmudgeon". In the series, the character's unorthodox diagnostic approaches, radical therapeutic motives, and stalwart rationality have resulted in much conflict between him and his colleagues. House is also often portrayed as lacking sympathy for his patients and having practices that allows him the time to solve pathological enigmas. The character is partly inspired by Sherlock Holmes. A portion of the show's plot centers on House's habitual use of Vicodin to manage pain stemming from a leg infarction involving his quadriceps muscle some years earlier, an injury that forces him to walk with a cane. This addiction is also one of the many parallels to Sherlock Holmes, who was a habitual user of cocaine. Throughout the series' run, the character has received positive reviews. Tom Shales of The Washington Post called House "the most electrifying character to hit television in years". In 2008, Gregory House was voted second sexiest TV doctor ever, behind Dr. Doug Ross from ER. For his portrayal of Gregory House, Hugh Laurie has won various awards, including two Golden Globe Awards for Best Actor in a Television Drama Series and a Screen Actors Guild Award for Best Actor from Drama Series. Laurie also earned Primetime Emmy Award nominations in 2005, 2007, 2008, 2009, 2010 and 2011. TV Overmind has named Gregory House the best TV character of the last decade. Gregory House was born to John and Blythe House on 15 May 1959 or 11 June 1959. House is a "military brat"; his father served as a Marine Corps pilot and transferred often to other bases during House's childhood. One place in which his father was stationed was Egypt, where House developed a fascination with archaeology and treasure-hunting, an interest which led him to keep his treasure-hunting tools well into his adulthood. Another station was Japan, where, at age 14, House discovered his vocation after a rock climbing incident with his friend. He witnessed the respect given to a buraku doctor who solved the case that no other doctor could. He also spent some time in the Philippines, where he received dental surgery. House loves his mother but hates his father, who he claims has an "insane moral compass", and deliberately attempts to avoid both parents. At one point, House tells a story of his parents leaving him with his grandmother, whose punishments constituted abuse. However, he later confesses that it was his father who abused him. Due to his father abusing him, House never believed that John House was his biological father; at the age of 12, he deduced that a friend of his family with the same birthmark was his real father. In the season 5 episode "Birthmarks", House discovers that this was true, after he ordered a DNA test that compared his DNA against John's. He is of Dutch and German ancestry. House first attended Johns Hopkins University as an undergraduate. Before choosing medicine as his discipline, he considered getting a Ph.D. in physics, researching dark matter. He was accepted to the Johns Hopkins Medical School, and excelled during his time there. He was a front runner for a prestigious and competitive internship at the Mayo Clinic; however, during this time in medical school, he was caught cheating by another student, Philip Weber. After an appeal process, he was denied re-entry into the Johns Hopkins Medical School. He then finished his last year of medical school at the University of Michigan, where, while working at a bookstore, he met his future employer and love interest &ndash; Lisa Cuddy , with whom he shared a night where "he gave her everything she asked for". During a medical convention in New Orleans that he attended shortly after graduating medical school, House first saw his eventual friend Dr. James Wilson among a "sea of boring people" clutching a package. House deduced that it contained divorce papers. While at a bar, Wilson accidentally broke an antique mirror and started a bar fight with a man who repeatedly played "Leave a Tender Moment Alone" by Billy Joel to the frustration of Wilson who indeed was going through his first divorce at the time. House bailed him out and hired an attorney to clear his name, thus starting their professional and personal relationship. House eventually became a Board certified diagnostician with a double specialty in infectious disease and nephrology. Approximately ten years before the beginning of the series, House entered into a relationship with Stacy Warner , a constitutional lawyer, after she shot him during a "Lawyers vs. Doctors" paintball match. Five years later, during a game of golf, he suffered an infarction in his right leg which went misdiagnosed for three days due to doctors' concerns that he was exhibiting drug-seeking behavior. House would eventually diagnose the infarction himself. An aneurysm in his thigh had clotted leading to an infarction and causing his quadriceps muscle to become necrotic. House had the dead muscle bypassed in order to restore circulation to the remainder of his leg, risking organ failure and cardiac arrest. He was willing to endure excruciating post-operative pain to retain the use of his leg. However, after he was put into a chemically induced coma to sleep through the worst of the pain, Warner, House's medical proxy, acted against his wishes and authorized a safer surgical middle-ground procedure between amputation and a bypass by removing just the dead muscle. This resulted in the partial loss of use in his leg and left House with a lesser, but still serious, level of pain for the rest of his life. House could not forgive Stacy for making the decision and this was eventually the reason Stacy left him. House now suffers chronic pain in his thigh and uses a cane to aid his walking. He also frequently takes Vicodin to relieve his pain. House does however break his addiction with psychiatric help, after he suffers a psychotic break. When Warner makes her first appearance in season 1, she is married to a high school guidance counselor named Mark Warner. Although she and House have a brief, intimate encounter during the second season, House eventually tells Stacy to go back to her husband, devastating her. At the beginning of season three, House temporarily regains his ability to walk and run after receiving ketamine treatment. However, the chronic pain in his leg comes back and House takes painkillers and uses his cane once again. The other doctors speculate that his cane and opiate re-usage are due to his psychological tendencies. During season five, House once again regains his ability to walk without pain after taking methadone, but soon stops after nearly killing a patient due to an uncharacteristic medical error. At the start of season six, after spending time in the Mayfield Psychiatric Hospital, House stops taking pain medications and finds other ways to deal with his pain, including cooking. Thirteen and Wilson discover that House is a great cook, attributing this to House thinking of ingredients in terms of chemistry. House eventually finds the one thing that seems to help the pain go away: practicing medicine. After he diagnoses a patient online for his team and he shows Doctor Nolan how this reduces his pain, Nolan suggests that House resume his medical career. In season 7 when Cuddy dumps him, he goes back on Vicodin. Whole or part of the information contained in this card come from the Wikipedia article "Gregory House", licensed under CC-BY-SA full list of contributors here.